The Online data dictionary is a digital platform designed to help users navigate the LSAY data. The dictionary brings together information from the LSAY datasets, questionnaires and metadata. Information is organised using topic areas and data elements and uses topic maps to identify the waves and cohorts in which data elements are collected. The LSAY datasets are large and complex with over 30,000 variables across six cohorts. To help users navigate the data, variables are grouped into topic areas using four hierarchical levels: major topic area, sub-major topic area, minor topic area and data element. LSAY collects information across four major topic areas: Demographics, Education, Employment and Social. 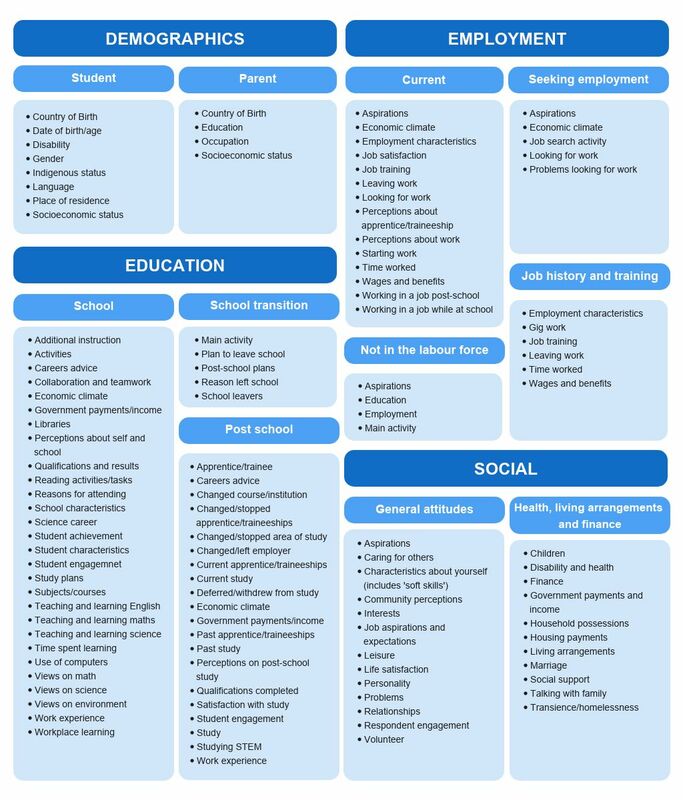 The diagram below outlines the major, sub-major and minor topic areas covered across the LSAY surveys. An additional set of variables that includes information on interview dates, survey mode and weights can be found under the major topic area ‘Sampling variables’. Please be patient —the data dictionary contains a substantial amount of information so can take some time to load. Users may prefer to explore the LSAY data using the Variable listing and metadata spreadsheet. For information on how to access the confidentialised unit record data see How to access LSAY data. We would love to hear from you! If you have any feedback, suggestions or requests, please email lsay@ncver.edu.au. Updated to include metadata for the Y15 wave 3 2017 data. Updated to include metadata for the Y09 wave 9 2017 data. Topic areas and data elements from the variable listing and metadata updated to promote consistency across cohorts.